New Delhi: The Narendra Modi government on Wednesday raised the minimum support prices (MSPs) of kharif crops by the most in six years in a bid to address rural distress. The move comes ahead of crucial elections in agrarian states including Madhya Pradesh, Chhattisgarh and Rajasthan this year, and general elections due by May 2019. It could potentially mitigate the political damage facing incumbent regimes because of the prolonged phase of farm distress. The move, however, could stoke inflationary pressures, warned economists. For the 2018-19 crop season, MSP for paddy—the main crop planted by farmers in the rain-fed kharif season—was increased to ₹ 1,750 per quintal, an increase of ₹ 200 per quintal, or a 13% hike over last year’s MSP. This is the steepest hike since 2012-13 (in percentage terms) and also the highest approved by the current government since it came to power in 2014. Among other crops, support prices for soybean, groundnut, moong and cotton were raised significantly, between 10% and 28% year-on-year. “The decision taken today by the Modi government is historic... it will help to increase farmer incomes and have a wider impact on the economy," Union home minister Rajnath Singh said at a briefing. He added that the costs to the government for implementing the MSP will be around ₹ 15,000 crore. A generous hike was widely anticipated following a budget announcement in February to fix crop support prices at a level which ensures at least 50% returns to farmers over cultivation costs. On Wednesday, for the 14 crops for which MSPs were announced, support prices were 50-97% over costs. However, the cost matrix used by the government does not include any imputed rental value of the land when it is owned by the farmer. “The scenario is definitely going to be better for farmers compared to last year," said Dharmakirti Joshi, chief economist at ratings firm Crisil Ltd.
Joshi added that on the inflation front, the MSP hikes will likely push food prices up mildly but a lot will depend on the effectiveness of MSP-based procurement. “Raising MSPs is simple, implementing it is a challenge." In the absence of significant procurement by the government, higher MSPs for crops (other than paddy) such as coarse grains, oilseeds and pulses may not lift wholesale prices for farmers. Currently, the government procures a large quantity of rice and wheat—up to a third of what is harvested by farmers. 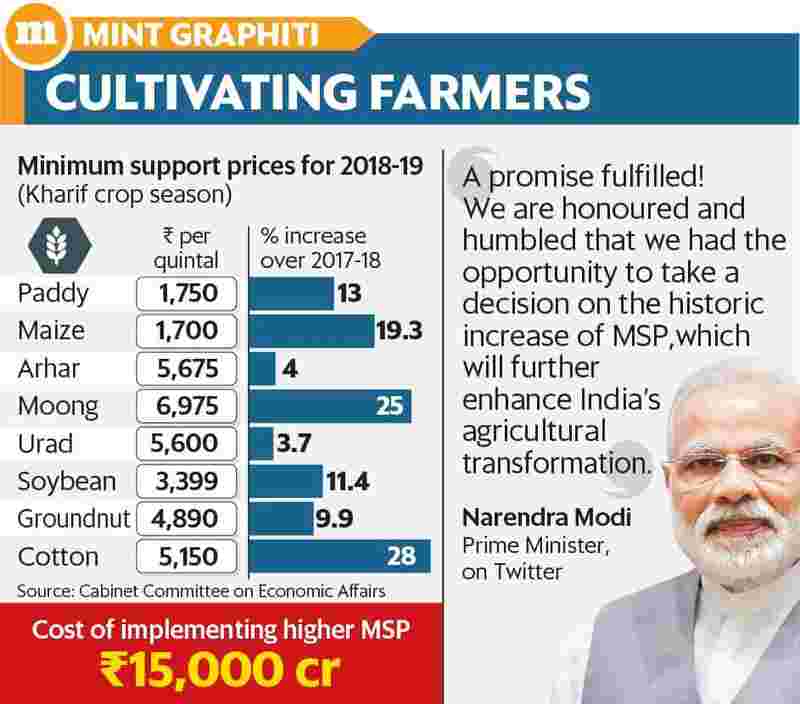 To ensure that farmers benefit from these MSP announcements, especially those growing pulses, oilseeds and coarse grains where state procurement is limited, the government is likely to announce a new MSP policy before kharif harvests begin in October. Whether the government procures directly or implements a price deficiency scheme, benefits to farmers will be higher if MSP announcements are implemented effectively, said chief economic adviser Arvind Subramanian. How crop prices shape up will be crucial in an election year. Since June last year, farmers across India have repeatedly hit the streets as a steep fall in farm-gate prices dented their incomes despite record harvests.